Ground dried ginger is used in this dish in Morocco, though if you prefer, you could crush fresh root ginger in a garlic press and use the juice instead. Serve with couscous. Heat the oil and butter in a large frying pan, and sauté the quails briskly for about 10 minutes, turning them to colour evenly. Add the ginger and season, then add the grapes and crushed garlic. 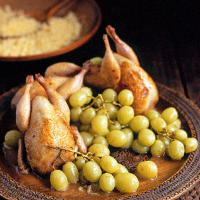 Cover and cook gently for 15–20 minutes or until the quails are cooked through and the grapes have softened. The Corker recommends- A clever, richly textured blend of chardonnay and viognier sets off this tender quail dish.